In this the second of our posts about Icons of Restless thinking, we’re discussing Paul Newman, the archetypal Hollywood Movie Star, with chiselled features and brilliant blue eyes. He’s here, not because of his movies (or because he makes my mum go weak at the knees) but, surprisingly, because of the legacy he’s left and his drive to always do, and importantly ‘be’ more. Like all our Icons of Restless Thinking, Paul Newman is here because of what he meant to us as creatives. As a rebellious 16 year old, I was introduced to him in the film Cool Hand Luke, a resilient character with an untouchable restless spirit that couldn’t be crushed. I wanted to find out more about the actor and discovered where he would’ve found inspiration for that role. Born in Shaker Heights, Ohio, a suburb of Cleveland, Newman was the younger son of a sports store owner of Jewish-German descent. From 1943 to 1946 Newman served as a US navy torpedo bomber radio operator in the Pacific Theatre of war. Nominated for an Oscar 10 times and winning the best actor trophy in 1987 for The Colour Of Money. Newman is best known for his leading roles in The Hustler, Cool Hand Luke and for playing opposite longtime friend Robert Redford in Butch Cassidy and the Sundance Kid. He appeared in about 60 films over a period of 50 years. Yet his many faceted, contradictory character renders the star image superficial. He was also a notable producer-director, a racing car enthusiast, a political activist and a philanthropist, counted as the person who had distributed more money – in relation to his own wealth – than any other American during the 20th century. It is possible that his charitable works may well outlive his other achievements. In 1982 he founded the company Newman’s Own, producing products such as pasta sauces based on his own home recipes. He devoted the company’s entire profits – over $400m to date – to causes throughout the world. His charitable work also extended to Summer Camps for ill children and land conservation projects in his home state of Connecticut. 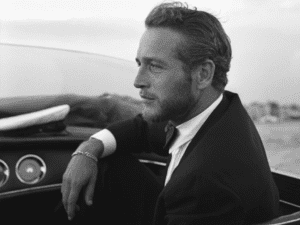 Paul Newman makes our list because he epitomises the Restless Spirit. He lived his work, making 62 films and being nominated for 10 Oscars, but unlike so many movie stars, he was more than just an actor. He had a relentless drive that included motor racing – being both the owner of an Indy Car Race Team, and a driver – finishing second in Le Mans in 1979 and winning his class (aged 70) at the 1995 24 Hours of Daytona. He had a passion for stage acting, directing, political activism, civil rights causes and perhaps most importantly using his talents to better the lives of others.